After the blitz tournament’s first day of play it was already clear that only two participants had serious chances of winning the Paris leg of the Grand Chess Tour – Hikaru Nakamura and Magnus Carlsen. The Norwegian signaled his intent from the start of the second day’s play. Wesley So had the World Champion pinned to the wall and gave him only a slight chance. But that was enough for Magnus. But from then on the champion blew hot and cold, with victories intertwined with losses, while his main rival took a more steady path to his goal. 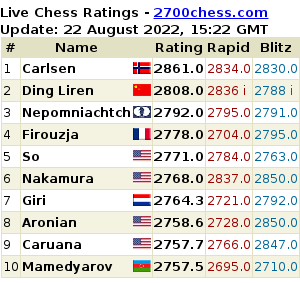 Anish Giri played a decisive role in the tournament table, losing to Nakamura but defeating Carlsen. 17.e5! Bxg2 18.exd6 Bc6 19.dxe7 Re8 20.Nd4?! 20.Qd3 (or 20.Qd2) 20…Rxe7 21.Qd6 Qxd6 22.Rxd6 would have led to an endgame with a big advantage for White. 20...Be4 It was probably stronger to defend the bishop with 20...Qb7!? 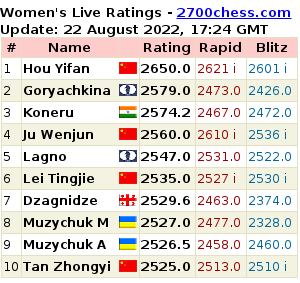 (20...Qc7; 20...Qc8) 21.Nxc6 Qxc6 22.Qd2 Nc5 (or 22...Ra7 23.b4 axb4 24.Qxb4 Qf3 25.Bf2 h5) 23.Qd6 Qb7 24.Bxc5 bxc5 25.Qxc5 Qxe7 with drawing chances. 21.Nxe6! Rxe7? 21...fxe6! 22.Rxd7 Bc6 was better. The opposite-coloured bishops in the middlegame create a sharp position and leave Black practical drawing chances. 22.Nxg7! Qb7 22...Kxg7 is met with 23.Rxd7! Rxd7 24.Qg4+ and a decisive advantage. 23.Bd4! Bh1 24.Qf2 Rae8? A blunder in a lost position, but 24...Be4 would have retained tension on the board. 25.Nxe8, and White went on to win after 41 moves. 1-0 (Commentary by Alexei Yarovinsky). The Norwegian’s defeat of Naka in the final round was irrelevant to the overall standings: Hikaru had already ensured first place and Magnus the runners-up spot. — Lennart Ootes (@LennartOotes) 12 июня 2016 г. — Hikaru Nakamura (@GMHikaru) 11 июня 2016 г. See all the games of the clear top two players in Paris. The players now head to Brussels for the next leg of the Grand Chess Tour, starting on Wednesday. They will also play rapid and blitz. The first decisive game in the Capablanca Memorial in Cuba occurred after an ending in the second round: Vassily Ivanchuk won without much difficulty against Zoltan Almasi.